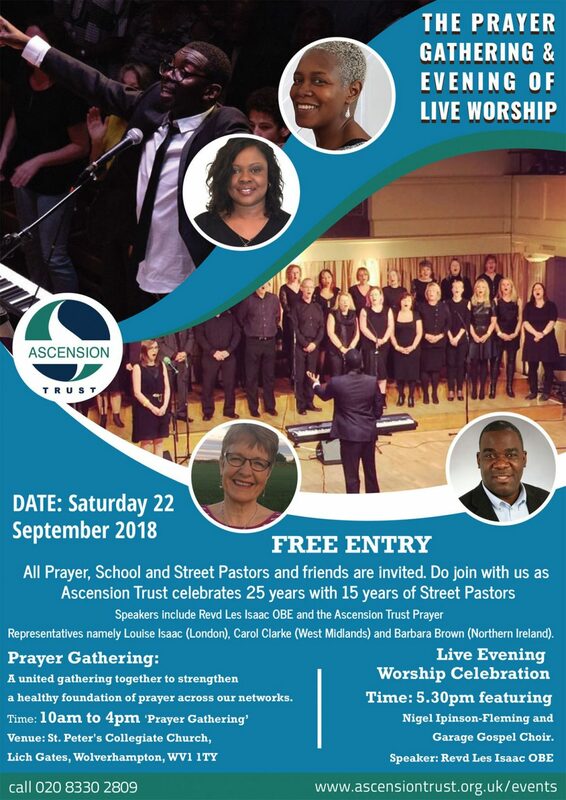 On Saturday 22nd September 2018 Ascension Trust will be holding it’s Prayer Gathering and an Evening of Prayer, Worship and Celebration at St Peters Collegiate Church, Wolverhampton. A united gathering together of churches, partners, Street / College / Rail / Response & Prayer Pastors, friends of Ascension Trust and all those part of our wider network. The event will seek to strengthen a healthy foundation of prayer across our networks through quality seminars and workshops on the topic of prayer. Speakers Include Rev Les Isaac OBE, CEO of Ascension Trust. Join with us for an evening of prayer, worship and celebration. * Please note- You will have to have a ticket for each event if you will be attending both.